Redflow is a market leader, the first flow battery company to commercially outsource the manufacturing of its products. Redflow ensures continuous product innovation in its R&D centre, located in Brisbane, Australia. The R&D centre is part of its global presence with Redflow offices in the USA, EU and manufacturing in North America. Redflow has transitioned to manufacturing to global giant, Flextronics. This, ensures scalable manufacturing with rigorous quality management and consistent production. RedFlow’s ZBM is sold, integrated and maintained through a network of global system integrators. Locked in a Trading Range. 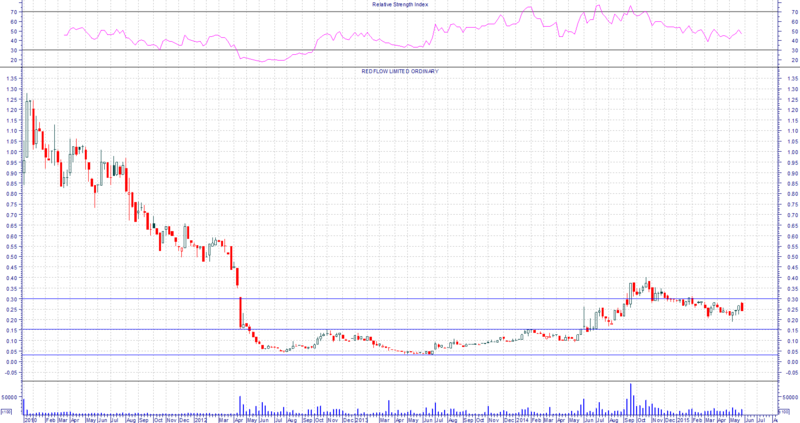 This is a weekly candlestick chart of the Redflow share price over the past five years since December 2010. The market took very little interest in the stock until April 2012 when the share-price fell below 15 cents, entering into a trading range with initial support at 3 cents. A year ago the 15 cent resistance level was penetrated to reach a high of 40 cents, only to fall back to a trading range between 15 and 30 cents. Redflow Limited has disappointed initial investors, and has fallen out of favour with the market. In the last year however interest has been re-kindled as the Zinc Bromide Module has moved to production to meet what could become a lucrative market. The appeal of the ZBM is in providing affordable energy storage and generation for renewable energy sources, limiting reliance on fossil fuels. ZBM batteries are already on the market for commercial uses, and will be applicable to the emerging home energy storage market, which seems to be set for expansion as the US firm Tesla gets set to penetrate the Australian market with its lithium-ion battery system Powerwall in the next year or two. Another US competitor looking to launch a battery storage product in Australia in early 2016 is Raghu Belur, co-founder of Silicon Valley start-up Enphase Energy. He points out that one-third of houses in Queensland have solar PV. Prices for mains-supplied power are more than four times as much as the feed-in tariff in some cases. Energy Australia is in talks with Enphase on its battery. AGL has launched a 6kwh lithium-ion battery, and will be looking to provide larger batteries in time. it is able to operate as a daily full-discharge, full power supplier of energy. it has a maintenance-free lifetime of energy. it is insensitive to variations in daily cycle depth of discharge. other storage technologies are temperature sensitive and need thermal controls. Redflow sees its products as becoming a valuable part of the new energy supply technology. ‹ CTN-Contango Microcap Fund. A review.